I was absolutely dying to read this! Pre-ordered it on Amazon and then sat waiting on launch day checking and re-checking my kindle expectantly. Of course I felt silly when I realised that NZ is a day ahead so launch day was actually… not until tomorrow. I thought Ryan’s first book was a masterpiece (whether I agree with his methods/ethics is another story) in terms of how the media machine in America is working and how easily it can be manipulated by the likes of… well Ryan! 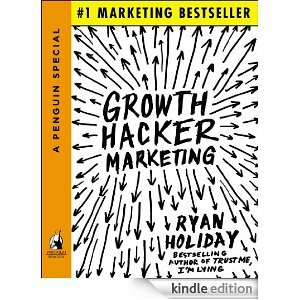 Growth Hacker Marketing is quite a different topic and style… much less controversial (a sneaky part of me would also say less enjoyable). Think less crazy media stunts and more… Seth Godinisms (my word) e.g. marketing is the product. I love this one! Primarily because if I ever write a book I completely imagine myself hiding in a cave (aka my bed) and then emerging with the new Harry Potter. Instead he suggests continuing to change the book based on feedback right through the process of writing. He mentions authors who post snippets of their chapters in blog posts and seek feedback that way. Or who even test different cover graphics/titles. (Tim Ferris is one example). Wanna read it yourself? Sweet it’s on Amazon for only $2.99! p.s. Google Stalk tip. If you want to research the companies that Ryan mentions in the book here’s a few: Hotmail, DropBox, Evernote, Airbnb, Uber, Apple, Amazon and Twitter.